June 27, 2011 - by Merrilee Proffitt - 2 Comments. For three days earlier this month, (June 8-10) close to 100 thought leaders from research libraries, archives and museums gathered at the Georgetown Conference Center to attend FutureCast: Shaping Research Libraries in a Networked Age. The meeting was well “amplified” (to steal a term from my colleague Lorcan Dempsey). In real time, we had a very active Twitter stream,* and a video feed. Immediately following the meeting, electronic versions of the talks and other collateral were posted to the event webpage. This short series of blog postings will serve as further amplification, summarizing the meeting itself. We invite you to continue the conversation by sharing your comments. Jim Michalko kicked off the meeting with a look “down the wrong end of the telescope,” reflecting back to his time as a student at Georgetown when the Lauinger Library was under construction. 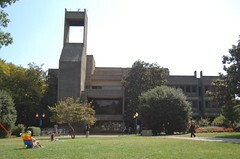 Although the Georgetown library was built in the Brutalist style and is a far cry from Gothic revival exemplars such as Sterling Library at Yale, the Lauinger Library is firmly ensconced physically at the “heart” of the campus. Detail from Sterling Memorial Library, Yale University. Photo by Günter Waibel. Long story short: “the network changes everything.” What’s the place of the library today? As intellectual life happens increasingly online, how do libraries maintain their place as the “heart” of research? The challenge, then, for the OCLC Research Library Partnership will be to create plan of work to help move institutions to a new way of operating. FutureCast was an opportunity to reflect on the future of the research library enterprise from the point of view of the evolving spheres of data consumption patterns, publishing, and higher education. We invited three keynote speakers to help look at how each of these areas are evolving, and then invited responders to help at the impact will be on the research library enterprise. How can we look up, to prepare for the future? We’ll start with the next blog post, on the evolution of data consumption patterns. *This meeting benefited from a higher than previous amplification quotient — 1/3 to 1/2 reported by raised hands they have a Twitter account. Although not everyone was Tweeting, the meeting was well documented by those who did. A special thanks to those who shared in this way, as it was a great help in producing a summary. It was also observed, looking at a room full of people with eyes cast downward, that people interact by looking away.